When you combine the beauty of wood with the benefits of tile, you get wood-look tile in Oxford, AL. This is an innovative way to incorporate the appeal of natural hardwood with the water-resistance of ceramic or porcelain tile. To install this flooring option in your home, look to Kemp Flooring. We are proud to offer our customers this attractive and versatile flooring product. You may not be familiar with all the benefits of ceramic wood tile, but our sales and design professionals are. Ask them to show you samples so you can see how this flooring looks for yourself. 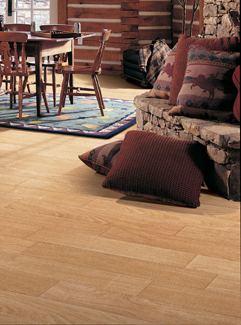 We offer a pleasing array of wood-look tile made from porcelain and ceramic in a variety of hardwood species. We’re confident you’ll find tile that enhances the appearance and value of your home. In our showroom, you find ceramic and porcelain in the shape of both planks and tiles. You can select what appeals to you and works with the room you want to install it in. For instance, you can choose porcelain planks with the majesty of mahogany or wood-look ceramic with the appeal of redwood. Porcelain is a dense and hard tile made from fine clay fired in a kiln. After undergoing this process, this tile is tough and durable. With glazes that seal the surface, tile is naturally resistant to water. You can install it in rooms that have running water or high humidity levels, such as the bathroom, kitchen, and basement. This offers more stability than solid wood, which reacts to water by expanding and contracting. Ceramic has many things in common with porcelain tile, but there are significant differences. Made of kiln-fired clay, ceramic is softer than porcelain, which means it’s easier to cut and install. It also comes with a smaller price tag. This flooring style is cool underneath but has a warm look due to the wood design. And, the grouting that is done during installation offers a unique appeal. Ask our sales and design professionals to share the differences with you so you can make a good decision about which is best suited to your home. For enduring beauty, we urge you to take advantage of our professional installation services. Tile requires skill, knowledge, and the proper tools to install properly. As you have to measure and cut, place in a bed of mortar, and finish with grouting, this is not a simple task. Schedule installation with our qualified technicians for wood-look tile floors that withstand the test of time. Contact us today to see and touch our wood-look tile for yourself. With a showroom in Oxford, Alabama, we proudly serve residential and commercial customers in Calhoun, Talladega, and Lincoln counties, as well as Bynum and Delta, and the surrounding areas.